What 100 Japanese foods would I recommend people try at least once? I tried to keep away from foods that are only available in certain regions, or even certain restaurants or homes (e.g. my aunt's homemade udon) and stuck to foods that are widely available in Japan. I've also tried to include foods from all categories and all price ranges, from wildly expensive matsutake mushrooms to cheap and sometimes not so good for you snacks. I also did not limit the list to 'genuine Japanese' foods (純和風), but include Western-style yohshoku dishes and a sprinkling of chuuka (imported Chinese) foods that are so ingrained in Japanese food culture that most people barely think of them as Chinese any more. And of course, I have eaten all of the foods listed at least once - in most cases many, many times. I like them all! The list is not numbered in order of preference. It's just how I happened to list them. I cannot emphasize enough the importance of rice in Japanese cuisine. The ultimate rice for most Japanese people comes from famed rice growing areas such as Niigata prefecture or Akita prefecture; famous varieties include _koshihikari_ and _sasanishiki_. And the best tasting rice is held to be new harvest rice or _shinmai_　新米. The older rice gets, the less desirable it is. This differs from some other rice cultures where aged rice (e.g. basmati rice) is held in high regard. See also How to cook Japanese rice. Tofu used to be sold by mobile street vendors, who would go around neighborhoods in the evening (just before dinnertime) tooting a loud horn. Housewives would rush to the vendor cart, bowls in hand, to buy fresh tofu. Nowadays mobile _tofu-ya_ have virtually disappeared in Japan, but small independent tofu stores do still exist. Most people just buy tofu from a supermarket or _combini_ though. See how to make your own tofu; how to make hiyayakko and agedashi dofu (another great way to enjoy tofu). Yudofu (湯豆腐）is a piping hot version of hiyayakko. Misoshiru 味噌汁　is miso soup, an osumashi おすまし　is clear soup, both fundamental parts of a traditional Japanese meal. Some people have a bowl of miso soup or clear soup at every meal. The difference between a miso soup made with proper dashi stock and good miso and an ersatz 'instant' one is like night and day. See Miso and miso soup basics and A week of miso soup. Nukazuke 糠漬け are vegetables pickled in a fermente rice-bran (nuka 糠）bed or nukadoko (糠床）. The vegetables are only left in the pickling bed for a few days. The care and feeding of a good nukadoko is a complex, much discussed matter, similar to the cult surrounding sourdough. The housewife or restaurant that has a top notch nukadoko is much respected. Unfortunately, nuka pickling at home seems to be a slowing dying art. Simply grilled fresh fish is a keystone of Japanese meals. Smaller fish such as sanma or the higher-class aji (horse mackerel) are grilled whole with their skins on, heads intact and innards left in, including sperm sacs or eggs. All parts of the fish are considered edible, and the innards are considered to be delicacies. Blue/oily fish or hikarimono （ひかりもの） are at their best in the colder months when they have more fat. Sanma used to be considered to be poor peoples' food since it was so cheap. 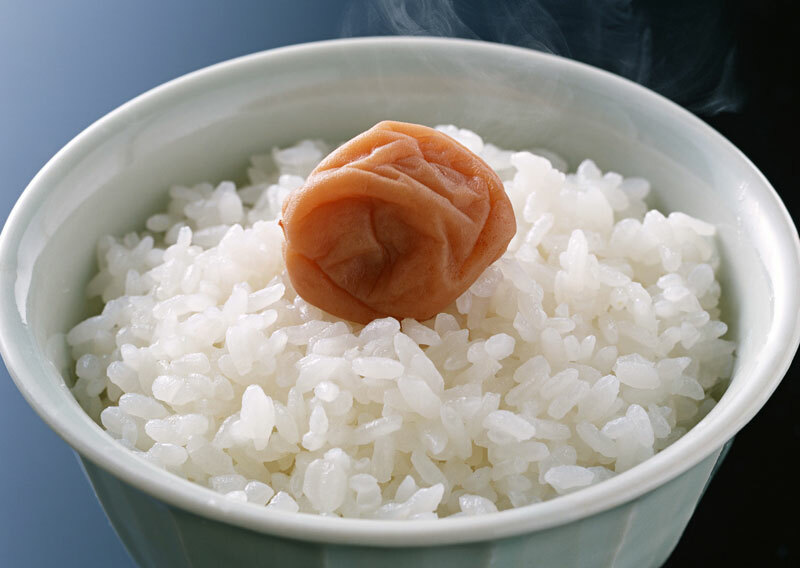 Umeboshi (梅干し）- salted, dried then pickled ume (梅）, a fruit that is a relative of the plum and the apricot. Very salty-sour, and acquired taste. Used in small quantities, it's a great flavor enhancer and appetite stimulant. Homemade is usually the best, and despite the effort it requires a lot of people still make their own umeboshi every year (including my mother). An acquired taste. See New rice and pickled plum and Oba-chan's pickled plums. Freshly made, piping hot crispy tempura. I prefer vegetable tempura like shiso leaves, eggplant and sweet potato. Matsutake (松茸）is a very fragrant, highly saught after, and __expensive as all heck__ mushroom. In Japan it grows near matsu (松）trees, which are supposed to greatly enhance their aroma. Matsutake are as highly regarded in Japan as truffles are in Europe. Japanese matsutake prices can reach four figures (in U.S. dollars) per kilo; imported matsutake are held in much lower regard, and are often sprinkled with 'matsutake essence' while cooking. The best way to eat a matsutake is to simply grill it over a hot charcoal fire, and sprinkle with a tiny amount of soy sauce and so on. Soba (蕎麦）or buckwheat is best known in the noodle format. But the best way to enjoy soba in my opinion is as sobagaki (そばがき）, a chewy-soft dumpling of sorts made out of fresh buckwheat flour, boiled in water. The cooking water is called sobayu (そば湯）and is sipped along with the sobagaki. This is a warm dish by the way. Mentaiko （明太子）and tarako （たらこ）are both marinated/salted pollack roe, even though the name tarako means "child of cod". Mentaiko is a spicy version, which originated in Korea and crossed the sea to the southern island of Kyuushuu. Fukuoka, the largest city in Kyuushuu, is famous for its mentaiko. Both tarako and mentaiko can be eaten as-is with plain rice, or used as a paste or sauce - see tarako and ponzu pasta. Tarako is often used griled until firm as an onigiri filling. (Mentaiko onigiri is not that common, probably because it's pretty expensive!) Tarako or mentaiko mixed with a bit of butter and spread on hot toast is delicous. An acquired taste. Okaka (おかか）is bonito flakes mixed with soy sauce; shiozake （塩鮭）is salted salmon. See Onigiri FAQ. 鯖押し寿司　is sushi you won't often encounter in sushi restaurants, though some Japanese restaurants do have it on their menus. It is a speciality of Okayama prefecture, but is popular all over Japan. Very fresh mackerel or saba (鯖）is fileted, salted and marinated, then pressed firmly onto a block of sushi rice; the whole is then left to rest for a few more hours. It's a style of sushi that is much older than the nigiri-zushi you are probably familiar with. からすみ　is salted and dried mullet roe. It has a very dense, sticky yet waxy texture (sort of like a salty-fishy an not sweet fudge), and is very salty. It's one of the 3 great delicacies, or chinmi (珍味）of Japan; the others are salted sea urchin (shiuni) and sea cucumber innards (konowata), both of which are sort of stomach-turning for me, but karasumi is an oddly addictive substance. You traditionally eat tiny slices of it to accompany your sake. Very much and acquire taste. おでん - see oden article and recipe. あんこう鍋 - monkfish hotpot or stew. Tabletop cooking is very popular in Japan. A small portable gas burner is placed in the middle of the dining table, a variety of cut up vegetables and some kind of protein are made ready, and they're cooked in a pot (in which they are called nabemono 鍋物 or simply nabe 鍋）of simmering water/broth, on a grill or shallow pan. Everyone at table picks out the pieces they want. Ankou is monkfish, a rather slippery, chewy fish with tons of flavor; together with lots of vegetables it makes a delicious nabe on cold winter days. うな丼 is unagidonburi （うなぎどんぶり）shortened; it's eel filets with a sweet-salty sauce on a bed of rice. A very rich, high calorie dish that's popular in the summer months, since all those calories in eel are supposed to keep your strength up! Kazunoko (数の子) is brined herring roe, and komochikonbu (子持ち昆布）is the same herring roe pressed onto konbu seaweed. Both have a distinctive crunchy texture and the salty flavor of the sea. An acquired taste. Japanese people love food with a slippery, slimy texture, and the slimiest of them all is grated yamaimo (山芋) or nagaimo (長芋), a type of yam. This is called tororo (とろろ, not totoro!). My form of tororo is when it's combined with cubes of fresh tuna, which is called yamakake （山かけ), but the ultimate slimy experience is tsukimi tororo (月見とろろ), a bowl of grated yamaimo with a raw egg which is supposed to look like a full moon. 玉露の新茶、new-crop Gyokuro green tea. How to brew a perfect cup of green tea. ミルキーキャンディー is a classic candy, with a character called Peko-chan who has graced the packaging since 1950. It is made by Fujiya (不二家). It tastes like condensed milk in candy form, and is another example of how Japanese people like that sweet, rather curdled milk taste. ワンコ蕎麦 or わんこそば. I'm breaking my 'no regional food' rule a bit, though you can get wanko soba outside of the region where it's a speciality (the Iwate prefecture in the north). Wanko soba is served in small bowls filled with a very strong tsuyu or soba sauce (cold) with various condiments (see Cold soba with dipping sauce). The customer holds the bowl out, into which the servers throw in a few strands of soba noodles. The customer slurps these up rapidly, and more strands are thrown in. This is repeated until the eater is full. An average male eater can consume about 60 servings. It's a gimmick, and encourages rapid eating. Wanko soba eating contests are the precursor of extreme eating competitions which are so popular in Japan. オムライス　is another example of yohshoku. The best place to have an omuraisu is at a small restaurant that specializes in yohshoku and makes their own demi-glace sauce. Failing that, a quick homemade version with ketchup is almost as nice. It's a big with kids in Japan. 煎餅 - せんべい　- means rice cracker, but the little snack-sized rice crackers that are now as common as potato chips around the world are at the bottom of the rice cracker quality scale. At the top are hand-crafted 堅焼き煎餅 (katayaki senbei); round rice crackers the size of your palm or bigger, made of pounded rice that is formed by hand, dried under the sun, and toasted over a charcoal fire until the rice patty pops and forms crunchy air pockets. It is then painted with dark soy sauce. The sweet version is then sprinkled with big grains of salt caled ざらめ　(zarame). 羊羹　- ようかん - is a dense, fudge like cake of sweet azuki beans; sometimes it contains chestnuts or other ingredients. To be eaten in slowly, in tiny mouthfuls, with green tea. The best yohkan is widely held to be from the old wagashi maker Toraya (とらや); a gift in a Toraya bag has much cachet throughout Japan. 石焼き芋　(いしやきいも)　are sweet potatoes cooked in hot stones, available from street vendors; a fixture on cool fall evenings. See Hoku-hoku is fall. 納豆（なっとう）- fermented, sticky/slimy soy beans. The quintessential 'eww' Japanese food item. Definitely an acquired taste. See Natto article and The Great Natto Diet Rush. Sujiko - すじこ　is salmon eggs still encased in the egg sac, while ikura - いくら　is the eggs removed from the sac membrane. Both are cured in salt or soy sauce and eaten raw. The best way to enjoy either is to just mound it on top of a bowl of rice, perhaps with a little grated fresh wasabi. A speciality of Hokkaido. トンカツ　or 豚カツ　is a breaded and deep-fried pork cutlet, a typical yohshoku dish. See Tonkatsu recipe. 胡麻豆腐 is an example of shoujin ryouri (精進料理), the refined vegan cuisine developed by Zen Buddist monks. See goma dofu recipe. Chawanmushi - 茶碗蒸し　is the hot version of tamago dofu - 卵豆腐; both are delicate, smooth, savory egg custards. See Tamago dofu recipe. Mochi - 餅　or pounded sweet rice, is available in many forms. As a symbol of bounty a tier of two or three rounds of mochi are placed in front of the Shinto altar in the home for the New Year (called kagami mochi). The best mochi is freshly pounded, eaten with brown sugar and kinako (toasted soy bean powder), or with grated daikon radish and soy sauce, or even with natto and green onions. That's the way they were served at my grandparents' house when I was very little. 銀ダラの粕漬け　is gindara, or silver cod, marinated in sakekasu (酒粕), sake lees mixed with other ingredients such as salt or soy sauce, mirin, and so on. The fish is marinated for a day or more, then grilled. The sweet-salty taste of the marinade permeates the firm fish and the result is heavenly. 干し柿　are dried persimmons (kaki). Bitter persimmons (渋柿　shibugaki)　are hung outside to dry slowly; the bitter liquid drips out as the fruit dries, leaving a densely sweet delicacy. The bitter liquid is saved and used to lacquer wooden bowls and boxes. Sushi rice stuffed into fried bean curd (油揚げ　aburaage) pockets. Typically a homemade sushi, rather than one served in a sushi restaurant. See Inarizushi recipe. 筑前煮 ちくぜんに　is a homely dish in which cut up chicken, lotus root, carrots, taro root, burdock root, shiitake mushrooms etc. are stewed together in a dashi broth. It is made in large quantities for the New Year's period, when it's heated up daily and eaten during the holidays (giving the cook of the household a break from daily cooking). It can be eaten at any time of the year though, especially the cold months. Filling and healthy! するめ　is salted and dried squid' it's chewy, rather like squid jerky. It is usually eaten shredded into fine strips; you can get it like that, or the whole squid (better quality surume is usually sold whole, to be grilled briefly at home). A standard snack to accompany sake (おつまみ　otsumami - see Yakitori below). My stepfather loves freshly grilled surume with a little mayonnaise and chili pepper (ichimi or nanami tougarashi). 焼き茄子　やきなす　- grilled eggplant, with しょうが shouga (ginger) and a bit of soy sauce, is a summertime The slim eggplants are grilled whole, without any oil, until they soften and the skin bursts; the charred skin is then peeled off, leaving the flower bract. The peeled eggplant is eaten ice cold. 歌舞伎揚げ is a round, deep fried rice cracker that has a distinctive crackly surface. It originated as a snack served at 歌舞伎　かぶき　kabuki theaters, allegedly. Nowdays it's a cheap and rather fattening snack. 肉じゃが　- Japanese meat and potatoes, quintessential お袋の味　おふくろのあじ　ofukukuronoaji ("mother's cooking"). See my mom's nikujaga recipe. ほうれん草のごま和え ほうれんそうのごまあえ　hourennsou no gommae - more "mother's cooking". Spinach, and other dark green leafy vegetables are always served cooked in traditional Japanese cuisine, usually quickly blanched as a side dish. Besides sesame dressing, a simple お浸し　おひたし　ohitashi (dashi stock and/or bonito flakes and soy sauce sauce) is also very popular. See how to blanch spinach, and gomaae and ohitashi recipes. ふきのとう　- butterburr shoots, blanched and de-bittered and cooked in a typically Japanese sweet-salty sauce. Since butterburr shoots are only available in the spring, this is a very seasonal dish. Other highly treasured spring vegetables include わらび　warabi - bracken fern (shoots), よもぎ　yomogi - a type of chrysanthemum, and 筍　たけのこ　takenoko - bamboo shoots. お好み焼き おこのみやき　- popular street food, originating in Osaka but now popular all throughout Japan and beyond! Often erroneously called Japanese pizza, I think it's more aptly described as a savory pancake. See Osaka style okonomiyaki recipe. お萩　おはぎ　- a traditional sweet, eaten in the fall. Very similar to ぼた餅　botamochi. See Ohagi/botamochi recipe. カレーライス　kareh raisu　is different from other curries! See recipe and a bit of the history of 'curry rice' in Japan. けんちん汁　けんちんじる　is a clear yet hearty vegetable soup. It is one of the most famous 精進料理　しょうじんりょうり　shoujinryouri (a refined vegan cuisine developed by Zen Buddhist monks in the Kansai region) dishes. A variation of kenchinjiru with bits of pork in it is called 豚汁　とんじる　tonjiru. ヤクルト is a sweet, slightly fruity, fermented probiotic milk drink that is supposed to be good for your digestive system. It's sold all around the world now, with plenty of imitators. Included here because it is really very post-war-Japanese. Also see Kalpis above (which doesn't make probiotic claims, but has a similar taste). A snack made up of spicy little rice crackers called 柿の種　かきのたね　kaki no tane (literally: persimmon seeds) and roasted peanuts. See needlessly long and obsessive article. 桜餅　さくらもち　is a traditional sweet that is eaten in spring, to coincide with the cherry blossom season. Sticky rice that is half-beaten and dyed a pale pink is wrapped around 餡　あん　an - sweet azuki bean paste. The whole thing is then wrapped with a preserved cherry tree leaf, which is slightly sour-salty. 豚の角煮　ぶたのかくに - braised pork belly. Similar to a Okinawan dish called ラフテー　- rafuteh. Japanese people eat a lot more pork than beef (other red meats are not eaten much). The butcher in my grandparents' town in Saitama prefecture (right next door to Tokyo) didn't even carry beef until the 1980s. See Buta no kakuni recipe. 大学芋　だいがくいも　literally means "university potato", probably because this hearty sweet snack is sold at the big university festivals that are held in the fall. Sweet potato chunks are deep fried then dipped in sugar syrup, which forms a hard, caramel-flavored coating, then sprinkled with sesame seeds. かっぱえびせん　is a puffy, crunchy shrimp flavored snack, manufactured by Calbee. Yes, Japanese cuisine purists will turn their noses up at this selection no doubt! But I love Kappa Ebisen, it's very Japanese, and it's here. It actually has ground up shrimp in it, so the maker claims that it's a good source of calcium!How Kappa Ebisen is made (Flash page in Japanese). 鶏のつくね　とりのつくね　- soft stewed chicken dumplings. Another example of 'mother's cooking'. Fish tsukune (mainly made of oily fish like herring or mackerel) are also popular. Chicken tsukune recipe. ハヤシライス　is Japanese beef stew. See recipe and main article. ゴーヤチャンプルー　is perhaps the best known dish of Okinawan cuisine. Its main feature is the use of bitter gourd, which is stir-fried with pork, egg and tofu to make a hearty dish. It's supposed to give you lots of energy yet cool your body at the same time, making it perfect for the tropical climate of Okinawa. どら焼き　どらやき　is another traditional Japanese sweet (wagashi). Sweet azuki bean paste is sandwiched between two small pancakes. お茶漬け　おちゃづけ　is rice with various salty/savory toppings, over which hot green tea is poured. It's often served as the last course in a formal Japanese meal, and it's also a popular midnight snack. See main ochazuke article. 佐久間ドロップ　or サクマドロップ　are fruit flavored hard candies manufactured by Sakuma Seika. (Seika means 'confectioner'; there are actually two companies called Sakuma Seika, both manufacturing hard candies, run by rival members of the same family!) The candies are coated with powdered sugar, which prevents them from sticking together, and come in a reclosable can. This candy bridges the gap between traditional Japanese sweets and postwar 'modern' sweets; while hard candies existed previously, the fruit flavoring was quite new at the time. Sakuma drops featured prominently in the Studio Ghibli movie Grave of the Fireflies (火垂るの墓). Sakuma Drops are on this list to represent the many delicious hard candies available in Japan! See also Meiji Chelsea. 切り干し大根　きりぼしだいこん　- shredded and dried daikon radish. There are many dried foods in Japan, which are still eaten regularly even if drying as a method of food preservation is old-fashioned. See Dried vegetables. 竹の子ご飯 たけのこごはん　is rice cooked with fresh bamboo shoots; 栗ご飯　くりごはん　is rice cooked with sweet chestnuts. One signifies spring, the other fall. More 'mother's cooking'! コロッケ　korokke is the Japanese version of croquettes. While you barely see croquettes much these days in the West outside of restaurants, in Japan they are an everyday food, part of yohshoku. You can buy them frozen or freshly made at any supermarket or convenience store, and many people make them from scratch at home too. クリームコロッケ　kureemu korokke　- cream croquettes - are made of stiff bechamel (white) sauce, usually with crabmeat or shrimp in it, and ポテトコロッケ　- poteto korokke are made of mashed potatoes plus something else (ground meat, corn, etc). Usually served with the ubiquitous Bulldog Sauce. 湯葉　- is a Kyoto speciality. Thin films of tofu are scooped off the top of vats of warm soy milk. It’s available in dried form and is usually used in soups and such. Fresh yuba made from fresh warm soy milk is considered a great delicacy and is usually eaten with a litle soy sauce, yuzu juice and such. Yuba is part of shoujinryouri. ラーメン　is imported from China, but has been adopted wholeheartedly by Japanese people. One only needs to watch the movie Tampopo once to see how obsessed Japanese people can get about good ramen. 最中　もなか　is another traditional sweet. A crispy waffle-like casing is filled with sweet azuki paste (an), a sweet custard-cream, or ice cream. 駅弁　えきべん　are bento lunches served at train station. They are one of the best ways to sample local delicacies around Japan fairly economically. If you can't travel around on trains throughout Japan, you can try the ekiben sold in department store food halls. A bit more about ekiben here. 枝豆　えだまめ　- the quintessential summertime beer snack, now famous around the world. Addictive, more-ish yet healthy - how can you go wrong with edamame? とりの唐揚げ　とりのからあげ　tori no karaage. Another imported-from-China and adapted to Japan food. My kind of fried chicken! See recipe. 葛餅　くずもち　- a cool summer sweet made from kuzu powder. See recipe. みたらし団子　みたらしだんご　- yet another traditioan snack: sticky mochi rice dumplings coated in a salty-sweet sauce. Mitarashi dango recipe. こんにゃくの田楽　こんにゃくのでんがく - Konnyaku served hot on a skewer with a salty-sweet dengaku sauce, which is made with miso, sugar and other things. Barely any calories! See more about konnyaku. 雪見大福　ゆきみだいふく　is a daifuku (mochi dumpling) filled with vanilla ice cream rather than the traditional sweet bean paste. A fairly recent invention, it's not-too-sweet and very nice on a hot day. すき焼き　is a dish from the Kanto/Tokyo area. Thin slices of beef are cooked in a shallow pot, usually on a tabletop gas burner, in a sweet-salty 'sauce' made in the pot by combining sugar, a bit of sake and soy sauce. After the meat gets going, vegetables, tofu, shirataki noodles and udon noodles are added to the pot. The 'dipping sauce' is a raw egg. At-home family cooking at its finest! 生八つ橋　なまやつはし　is a traditional refined sweet from Kyoto flavored with nikki or cinnamon. See yatsuhashi recipe. はんぺん　is a airy-light fish cake, made of ground up white fish, yamaimo and egg white. It's commonly available readymade in any food store, but I think it has a refined flavor and texture to rival any French quenelle or the like. It is used in soups, stews, and so on, but my way to eat it is to just panfry it in oil or butter until golden brown. It's also good stuffed with a ground meat mixture. 野沢菜漬け　のざわなづけ　and 高菜漬け　たかんづけ　are a traditional preserved mountain food: freeze-dried greens that are salted down. Very nice as onigiri wrappers. きりたんぽ　is a traditional food from the north of Honshuu, especially Akita prefecture. Pounded rice cakes are formed around a skewer and grilled. These are the eaten as-is with a little soy sauce or miso, or put into soups and stews. Chewy, doughy and very Japanese. 甘納豆　あまなっとう　- unlike regular natto, amanatto (sweet natto) are not sticky or fermented; they are just beans with a crystallized sugar coating. A traditional sweet snack, eaten especially around the end of the year. 奈良漬け　ならづけ　could be the oldest known pickle in Japan. A speciality of Nara, the first capital of a unified Japan, various vegetables like gourds and cucumbers together with ginger are pickled in sake lees. The sake lees are changed several times before the pickles are ready. The resulting pickles are semi-transparent and sweet. Related: wasabizuke, vegetables pickled in wasabi mixed with sake lees. アジの干物　- 干物　ひもの　himono means dried fish. Dried fish in Japan is usually not dried to a cardboard-hard state, but rather eaten when still a bit soft. Aji or horse mackerel is delicious dried or semi-dried, cured with just salt or with a sweet mirin coating (this is called mirin boshi). ベビーラーメン, or officially ベビースターラーメン　is a salty snack that looks like little dried bits of instant ramen - it probably is bits of instant ramen, deep fried for good measure. It comes in little packets which are all connected in one long strip, useful for hanging up in a small store. Small snack and confectionary stores called 駄菓子屋　だがしや　(dagashiya) used to exist in every neighborhood, selling homely snacks like Baby Ramen and Botan Candy, but they are now sadly a thing of the past, existing only in Showa-era 'amusement parks' and the like. The good news is that Baby Ramen still survives. Update as of 2010: Dagashi stores seem to be making a slow comeback, on the wave of a general trend for Showa era nostalgia. 昆布茶　こぶちゃ - also read kombucha, but do not confuse it with the drink from the mystery Russian mushroom. This is a 'tea' made with salty pieces of soft konbu seaweed. It is drunk as a tea, even though it 's salty - rather like British people drink Bovril dissolved in hot water. It can also be used as an instant dashi. カステラ　- a Japanese spongecake that came via Portugal from Spain in the 17th century. Sweet and airy, usually with a honey flavor. See kasutera recipe. 田作り　たづくり　is a traditional dish that is part of お節料理　おせちりょうり　- osechiryouri, New Year's feast cooking. It consists of tiny little dried fish that are cooked in a sweet-salty sticky caramel like sauce. Sesame seeds are added too. The numerous little fish signify a wish for a good harvest　and prosperity (little fish like this apparently used to be used as fertilizer in the rice fields.) In old Japanese tazukuri is called ごまめ　gomame. ソース焼きそば; yakisoba is of course derived from Chinese lo mein, but the Japanese version made with Bulldog sauce is well, very Japanese. A typical street stall snack. かまぼこ　is a rather rubbery firm fish cake, rather like a fish sausage in texture. It is usually formed on a small wooden board. It's often dyed pink on the outside, and pink and white alternating slices of kamaboko are a part of お節料理　おせちりょうり　- osechiryouri, New Year's feast cooking. Kamaboko is eaten year round as a side dish. 親子丼ぶり　おやこどんぶり　- literally 'parent-child bowl'. A donburi is both the name of the container (bowl) as well as the name of the food which is served in it - various things on top of a bed of plain rice. An oyako donburi consists of chicken pieces and vegetables encased in half-scrambled egg. Other donburi include gyuudon (beef donburi), tendon (tempura donburi), katsudon (tonkatsu donburi), tekkadon (raw tuna cube donburi), and so on and on. Typical lunch food. 栗きんとん くりきんとん　is another part of お節料理　おせちりょうり　- osechiryouri, New Year's feast cooking, consisting of whole chestnuts cooked in sugar syrup in a sweet potato paste　that is dyed yellow with a gardenia seed. The golden colors of the dish signify a wish for good fortune in the coming year. Japanese potato salad (ポテトサラダ）is made with plenty of Japanese mayonnaise (which is rich and slightly sweet) and is served cold, often as an accompaniment to a hot dish like grilled fish. Japanese people love mayonnaise. See Japanese potato salad recipe. Also see Diane's 100 Chinese foods to try before you die on Appetite for China! Want more lists? The Big List of Must Eat Lists.